Does your truck or trailer eat tires? Are you frustrated because no one knows why? If you’ve checked all the obvious things, it’s possible the axles are out of alignment on the trailer or on the bobtail. If you are needing to replace those tires we have a selection of trailer tires and wheels in our parts department. Heavy Duty customers can now diagnose tire wear conditions in 1/3 of the time. 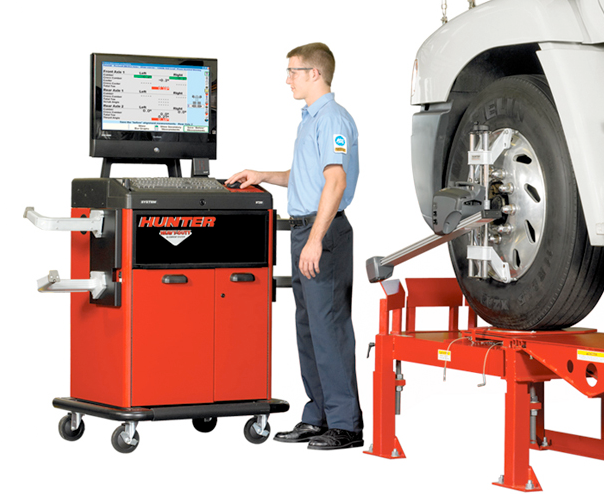 New technology from Hunter Engineering provides accurate, 3-axle wheel alignment readings in just 4 minutes. This truck alignment equipment features standard wheel clamps that allow clamping of wheels 15-28″ in diameter. Optional mini clamps. With this heavy duty alignment machine, no jacking is required! Compensate all sensors at once & short roll comp. Easily move vehicle for rolling comp, rechargeable battery & doubles as a wheel chock. Auto-locking turnplates & built-in turnplate bridges allow for rolling comp. Integrated electronic components enhance reliability, Lightweight, rubberized design & Impact-prone areas protected by integrated rubber bumpers.